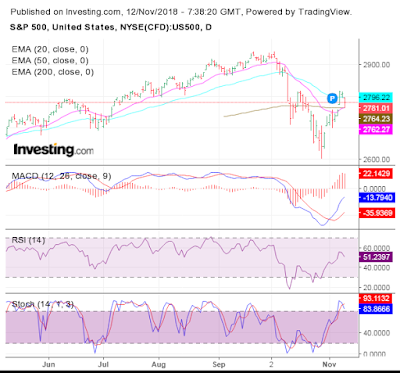 The daily bar chart pattern of S&P 500 climbed above its three EMAs back into bull territory on Wed. Nov 7. Bear selling dropped the index to seek support from its entangled 20 day and 200 day EMAs. The index bounced up to close just above 2780 with a gain of 2.1% on a weekly closing basis. However, bearish hopes have been kept alive as the index closed below its 50 day EMA. Daily technical indicators are giving conflicting signals. MACD is rising above its signal line in bearish zone. RSI is falling towards its 50% level after crossing above it. Stochastic is about to fall from its overbought zone. Expect some consolidation or correction. On longer term weekly chart (not shown), the index closed just below its 20 week EMA but above its 50 week and 200 week EMAs in a long-term bull market. Weekly technical indicators are turning bullish. MACD is falling below its signal line in bullish zone, but its downward momentum has reduced. RSI is facing resistance from its 50% level. Stochastic has crossed above its 50% level. 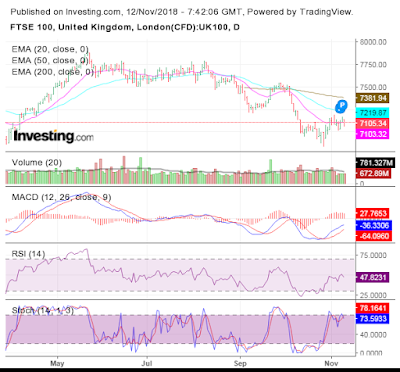 The daily bar chart pattern of FTSE 100 consolidated sideways during the week as it oscillated about its 20 day EMA. The index managed to close just above its 20 day EMA, eking out a weekly gain of 11 points. However, by closing below its 50 day and 200 day EMAs, the index remained in bear territory. BrExit tension appears to be hanging heavy over the market. Daily technical indicators are looking slightly bearish. MACD is rising above its signal line in bearish zone, but its upward momentum is reducing. RSI faced resistance from its 50% level and has turned downwards. Stochastic tried to re-enter its overbought zone, but has dropped down. Some more consolidation or correction is likely. On longer term weekly chart (not shown), the index closed below its 20 week and 50 week EMAs but above its 200 week EMA in long-term bull territory. Weekly technical indicators are in bearish zones. MACD is falling below its signal line bit its downward momentum has reduced. RSI and Stochastic have emerged from their respective oversold zones, but are not showing much upward momentum.